Recently the student body received an email from the office of protection. This email modifies the opening hours of all gates making Main Gate and Sea Gate the only gates open 24/7. 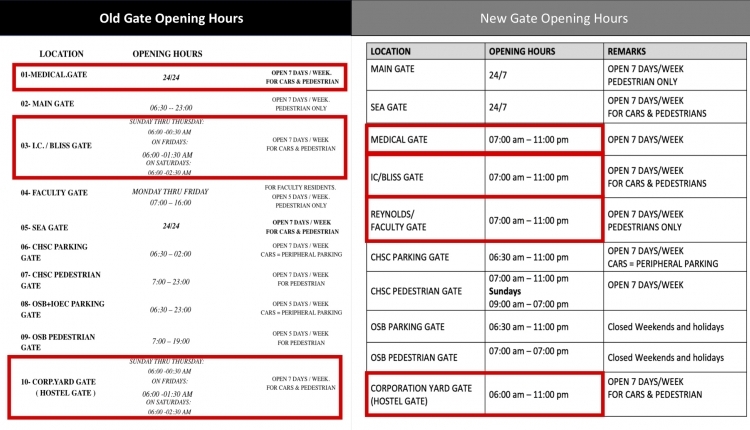 Other gates such as Medical, Bliss, Reynolds and Corporate Yard (New Women's) gate were made to close at 11 pm. The presence of the New Women's dorms in the periphery of the main campus and the early closing of this gate limits the ability for dorm residents to move freely after 11 pm. In addition, the early closing time of Reynold's building limits student body and faculty access to the off-campus premises. The early closure of the medical gate and the proximity of the medical gate to the AUBMC (American University of Beirut Medical Center) reduces the student body's access to medical services in the case of medical emergencies. We, the student body, call on the American University of Beirut to extend the opening of Corporate Yard (New Women's) gate, Medical gate, and Bliss gate until 1:30 am to guarantee the safety of all students. We also call the opening of Reynold's gate 24/7. The Gate Opening Hours AUB petition to American University of Beirut was written by Marwan Jalaleddine and is in the category Education at GoPetition.